Poren Huang (Chinese: 黃柏仁, 1970-), a Taiwanese sculptor, was born in Taichung County, located in central Taiwan. Poren Huang was born into a wood carving family. During the time of his grandfather and father, the woodcarving industry in Taiwan was at its peak. Woodcrafts were often exported, and during the heyday, their woodcarving factory had employed more than 100 craftsmen to produce woodcrafts. At that time, they kept many dogs throughout the factory to prevent theft. 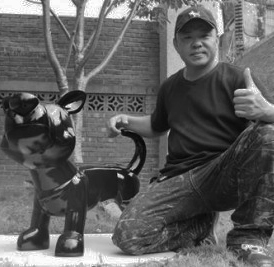 Hence, Poren Huang grew up among woodcarving and dogs. However, he not only has exquisite carving techniques, but is also born with a keen sense of observation and extraordinary sensitivity, where his appreciation of life is expressed through sculpturing. Therefore, he best understands the difference between crafts and art. After graduating from the Taipei’s Fu-Hsin Trade and Arts School Department of Sculpture in 1989, he began his artistic creations and produced works that are most widely discussed. The diversity of ideas and concepts in each and every piece of his work stir bountiful associations in his audience. However, from the very beginning, Poren Huang’s father was firmly opposed to his career in art, and even threatened to severe their father-son relationship. That was because in the past, woodcarving masters had left their factory due to the hardship and poverty of an artist’s life. His father did not wish the same mistake on his children, and resorted to the threat in the hope that he would be able to eke out a stable living by continuing in the woodcarving industry. However, Poren Huang’s strongly artistic nature could not be satisfied with the arrangement, and insisted on creative work. Nevertheless, he did not wish to leave his family, and with a positive attitude, quietly set about to create. At the same time, he also participated in many sculpture competitions, and his innumerable awards attracted media interviews and reports, eventually giving his father a peace of mind. Poren Huang Boren uses the dog as his theme to express his tenacious refusal to surrender his creative works while also demonstrating his absolute loyalty to his family by building his family before developing his personal art. 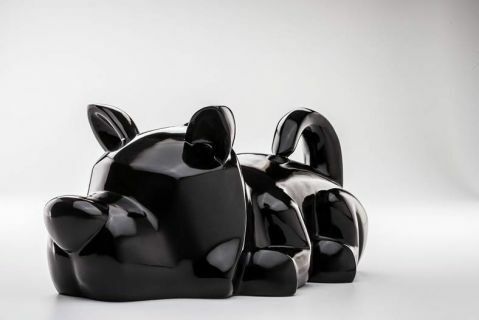 His “I’m Not Happy Now!”, “Home” and “Generation to Generation” bronze sculptures are seemingly whimsical, yet they were created during Poren Huang’s lowest point in life when his family failed to understand his insistence on art. However, he was neither pessimistic nor resentful, but instead created “The Dog’s Notes” series that draws smiles from his audience.